On a wintry morning in Beijing in 2010, two large vehicles drove around Tiananmen Square with a rather odd objective. Instead of trying to melt snow to clear the roads, these vehicles, equipped with high-powered heaters, were instead melting snow and collecting it to increase the city’s water supply. Designated snow-melting areas were spread across the city. The snow collected would be stored in dammed sections of three rivers that run through the municipality and eventually be used for road cleaning, irrigation, and to supplement river levels. Beijing had to take these snow-melting measures to meet the demands of its rapidly-growing population: the city’s consumption of 3.55 billion cubic meters (938 billion gallons) of water in 2009 surpassed its water supply of 2.18 billion cubic meters (576 billion gallons). In 2010, Beijing’s population was 19.6 million; in 2011, it was almost 20.2 million. In one year, the city grew by 600,000 people — basically the size of Boston. What is happening in Bejing is a microcasm of China’s growing problem of increasing energy demands and decreasing water supply. This is not unique to China. In previous posts, we have seen examples of this in the U.S., the Middle East, and Australia. However, it is particularly stunning in the case of China because it is the world’s most populous nation and has the second largest economy. Furthermore, China is the world’s driest countries. Over the last decade alone, China’s economy created 70 million new jobs. According to the World Bank, this year, the same economy generated the world’s largest markets for cars, steel, cement, glass, housing, energy, power plants, wind turbines, solar panels, highways, high-speed rail systems, airports — the list goes on. China’s economy has increased more than eightfold since the mid-1990s and water consumption has increased more than 15 percent in that period. At the moment that China is solidifying its standing as a superpower, competition between energy and water threatens to halt its progress. The gap is signified by a converging of three important trends which highlights the crucial relationship of the water-energy nexus: rising economic development, increasing energy demand, and water scarcity. China has roughly 617 billion cubic meters (163 trillion gallons) of water available for all uses. About 63 percent is for agriculture, 12 percent is for municipal and domestic use, and 23 percent for industry use. China’s total water resource has dropped more than 13 percent since 2000, meaning it has lost 350 billion cubic meters (93 trillion gallons) of its water supply. To put this in this perspective, each year, China has lost as much water as the amount that flows through the mouth of the Mississipi River in nine months. Chinese climatologists say a lot of this is because of climate change, which is disrupting patterns of rain and snowfall. In that same period since 2000, coal production has tripled to 3.47 billion metric tons (3.83 billion short tons) a year. National projections say that the country’s coal industry will need to produce an additional one billion metric tons of coal annually by 2020. Freshwater needed for mining, processing, and consuming coal accounts for 80 percent of industrial water use in China; at roughly 112 billion cubic meters (30 trillion gallons) a year, coal industry consumes one-fifth of the country’s water. China’s demand for energy, particularly for coal, is outpacing its freshwater supply. Beijing’s dire need for water also reveals another constraint of China’s water supply, which in and of itself is not new. 80 percent of the rainfall and snowmelt (two major sources of freshwater supply) occurs in the south, while the mostly desert regions of the north and west receive 20 percent of the precipitation. What’s new is that China’s surging economic growth is fueling a fast-expanding industrial sector. Industry uses 70 percent of the country’s energy, and more energy supplies is needed to meet the booming growth. However, unlike its water supply, China’s coal reserves (its main energy resource) are mostly found in the north. The problem, say government officials, is that there is not enough water to mine, process, and consume those reserves, and still develop the urban and manufacturing centers that China envisions for the region. The national and provincial governments have been incredibly effective in enacting and enforcing a range of water conservation and efficients measures. These policies have sharply reduced waste, shifted water from agriculture to industry, and slowed the growth in national water consumption. For example, Beijing and China’s major cities are retrofitting their sewage treatment systems to recycle wastewater for use in washing clothes, flushing toilets, and other greywater applications. In short, China has been radically changing traditional approaches to water management. The irony is that the increasing greenhouse gas emissions coming from the fast-expanding coal industry is contributing to the water shortage problem. Emissions are the main contributor of climate change, which scientists say is responsible for disrupting patterns of and decreasing rain and snowfall in China. Finding solutions to address freshwater shortages is important in the short term. However, most of the current efforts to mitigate water scarcity are “band-aid” solutions (melting snow, retrofitting sewage systems, rerouting water geographically, etc. ), while the main cause of the issue — the the expansion of industry which demand more coal to be burned, which in turn affects climate patterns, causing less rainfall — remains largely unaddressed. For now, anyway. Another way the government is trying to reduce freshwater consumption is through transitions to renewable energy sources, which require less water than fossil fuel sources. China has launched enormous new programs of solar, wind, hydro, and seawater-cooled nuclear power. However, this is not making that much of a dent on supplying current energy demands, 70% of which is supplied by coal. Today, China consumes more than 600 billion cubic meters (159 trillion gallons) of water annually. By 2020, China, the largest producer and consumer of coal, will mine and use up to 4.5 billion metric tons (5 billion short tons) of it. Largely as a result of this, the country’s consumption of water is projected to reach 670 billion cubic meters (177 trillion gallons) annually. China has enough coal. The globally-significant question that needs to be answered is where China will find enough water to make developing new coal reserves possible. While they help, band-aid solutions such as melting snow won’t be able to bridge the increasingly gaping ravine between energy demands and water shortages. Tags: agriculture, band-aid solutions, beijing, china, climate change, coal, coal production, coal reserves, drought, economic growth, economic markets, freshwater, greenhouse gas emissions, greywater, greywater applications, industrial water use, industry, population growth, precipitation patterns, renewable energy programs, renewable energy sources, renewable energy transitions, rerouting water, retrofitting sewage systems, snow melting, superpower, tiananmen square, water, water demands, water management, water scarcity | Permalink. 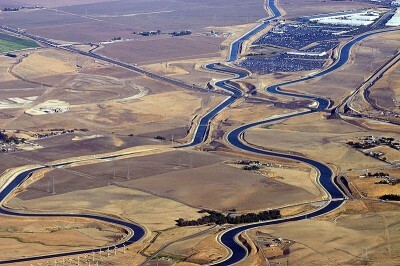 In 2005, Congress mandated a federal water and energy roadmap. The Department of Energy partially responded to the call in December 2006 with a report on the interdependency of energy and water called “Energy Demands on Water Resources.” Yet, to date, there is still no national research program directly aimed at understanding the intimate and complex relationship between water and energy in a comprehensive way. There is growing concern whether an appropriately-routed and affordable supply of water will exist to support the U.S.’s growing electricity demands, in particular around matching geographical water availability to energy need. 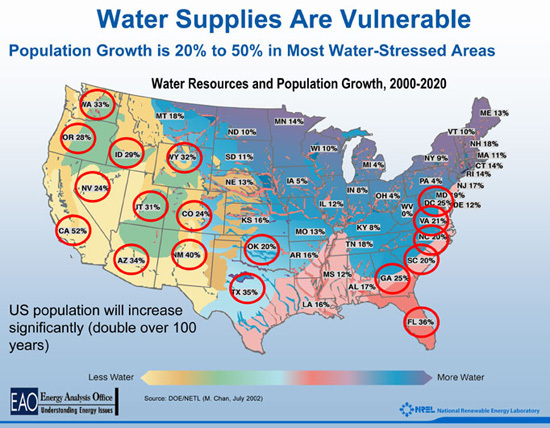 For example, in the 1990’s, the largest regional population growth of 25% occurred west of the Rocky Mountains, one of the most water deficient regions in the U.S. Water consumption in the western U.S. is much higher than other regions because of farming demands. It is estimated that over one million gallons of water is needed each year to irrigate one acre of farmland in arid conditions. This means that in 2000, the majority of freshwater withdrawals (86 percent) and irrigated acres (75 percent) were in the western states. State lawmakers and natural resource managers have traditionally addressed water and energy as two separate issues. However, water and energy are deeply connected, so the sustainability of one requires consideration of the other. Thus, resource managers and lawmakers in many places are beginning to take a more holistic approach to the management of water and energy. At least nine states (Arizona, California, Colorado, Connecticut, Nevada, South Dakota, Washington, West Virgina, and Wisconsin) have statutes that recognize the nexus between water and energy. A statute is legislative law. Three states in the more arid West (Arizona, California, and Nevada) have statutes that specifically refer to the use of water for electricity power generation. 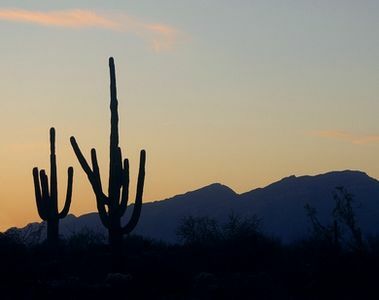 In Arizona, Statute § 45-156 requires electricity facilities to request legislative authorization in order to divert water to generate over 25,000 horsepower (18,642 Megawatt-hour) of electric energy. Statute § 45-166 says that an electricity generating plant (most of which are coal-operated) can use up 34,100 acre-feet of water each year, including water used for mining, coal transportation, and ash disposal. In California, Code § 5001 exempts individuals who extract groundwater or surface water for generating electricity from submitting a “Notice of Extraction and Diversion of Water”. In Nevada, Statute § 533.372 says the State Engineer can approve or disapprove any application of water from beneficial use to a use that generates energy that will be exported out of Nevada. In California, generating electricity is one of the few reasons that exempts individuals from notifying the state that they are diverting water and how much they’re diverting. In contrast, in Arizona and Nevada, legislation is trying to apply some limits to the amount of water that can be used for electricity generation, or at least toward electricity that leaves the state. I suspect one of the main reasons for the contrast is resource priorities. Arizona and Nevada are two of the most arid states in the U.S.: Nevada ranks number one and Arizona fourth for the least amount of annual precipitation. Nevada’s Division of Water Resources says its mission is “to conserve, protect, manage, and enhance the state’s water resources … through the appropriation and allocation of the public waters.” Arizona’s Department of Water Resources is stronger with their intention and directly say that the state places a high priority on managing its limited water. California, in contrast, does not even make the top 10 most arid states based on annual precipitation. 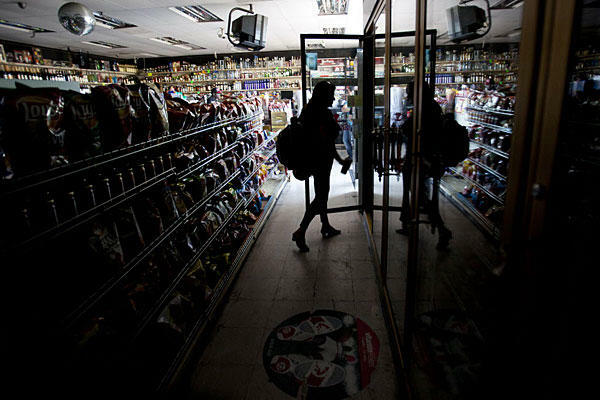 With the California electricity crisis of 2000 and 2001 and the one more recently in 2011 fresh in memory, California officials are much more worried about managing electricity demands and do whatever is necessary to avoid perennial summer blackouts. Understandably so — the early 2000’s electricity crisis costed the state $40 to $45 billion. Though they exhibit a step in addressing water and energy issues together, these state-level legislation have weak influence on the impacts that conventional electricity generation has on water supply and quality. “US policy makers continue to overlook the implications of increasing water scarcity when they evaluate the use of coal and nuclear power,” says a report, “The Hidden Costs of Electricity: Comparing the Hidden Costs of Power Generation Fuels,” released in September by the Civil Society Institute. When it comes to water impacts, the report finds that renewable energy sources have the least water impact. However, coal, nuclear, and natural gas resources have the highest hidden costs. This is worrisome since these are also the three most dominant means of producing electricity in the U.S. today. Coal and nuclear plants use (and lose) 300-1,000 gallons of water per Megawatt-hour (MWh). However, these plants withdraw a lot more water than that for its steam heating and cooling process — anywhere from 500 to 60,000 gallons per MWh depending on the cooling system. The water that is returned to the environment is wastewater which degrades river water quality. Furthermore, the mining processes for the energy resources in these plants (coal and uranium) contaminate groundwater. For natural gas, the major water costs come from extraction processes, such as fracking and coalbed methane recovery, which require large volumes of water and contaminate ground and surface water. How can we ensure the quality of water that returns to the environment after it’s used by power plants? How can power plants be more water efficient so there aren’t such vast differences in the amount of water required for cooling? How much water should be used for extraction and mining? How can these processes be better regulated to minimize contamination effects? How do we include water impacts to strengthen transitions to renewable energy sources? All these are questions that have yet to be addressed by legislation and government management in an integrated way both at the state and national levels. Tags: arizona, california, california electricity crisis, conventional energy sources, energy, energy and water policy, energy extraction, energy generation, energy production, nevada, power plants, state legislation, water, water energy statutes, water scarcity, water treatment, water-energy nexus, western states | Permalink. Last year, Texas experienced the worst single-year drought in recorded history. Ken Saathoff, an official with the state electric grid operator, said “we will be very concerned” if it does not rain by spring. This seems odd at first. Why would someone who works in the electricity sector care so much about rainfall and drought? Saathoff’s concern highlights the important relationship between two resources that has been gaining much attention (and concern) in recent years. Water and energy were once thought of and treated as separate issues. Growing population demands and resource shortages, however, underscores how much these two resources are interlinked. Energy means a lot of things. We usually say we need to eat so we have the energy to do work. And that is what energy is fundamentally: the ability to do work. In this particular post, we’ll be talking about a specific kind of energy: electric energy. Electric energy plays an important role in almost every aspect of our lives: it lights stores, makes factories work, keeps the refrigerator cold, and powers our electronic devices. What may not be as apparent is that electric energy also helps bring the water we use. The intersection of water and energy issues is known as the “water-energy nexus.” It points to how much energy is needed to pump, process, transfer, store, and dispose water. It also shows how much water is used to extract, generate, and transmit energy. Most sources (including Sandia National Laboratories, National Conference of State Legislatures, and Circle of Blue) say that about 4% of national electricity use goes to moving and treating water. In some regions, this percentage is much higher. For example, the California Energy Commission reports water-related energy use constitute 19% of the state’s electricity and 32% of its natural gas. A large part of the issue is that where water is needed is not always where it is most abundant, requiring large amounts of energy to move water over distances. Generating and distributing energy also require large amounts of water. The Network for Energy Choices says that U.S. power plants use more fresh water than irrigation while Sandia National Laboratories says that agricultural water use is still the highest. Despite arguments in ranking, most organizations (including Network for Energy Choices, Sandia National Laboratories, and National Renewable Energy Lab) agree that U.S. power production requires 140 to 200 billion gallons of water daily. That’s 200,000,000,000 gallons! This accounts for almost 50% of all national freshwater withdrawals. This means that in times of drought, when rivers or reservoirs dry up, power plants in hard-hit areas may not have enough water to operate. Water is also crucial for other parts of energy production, including energy extraction, refining and processing, and transportation. 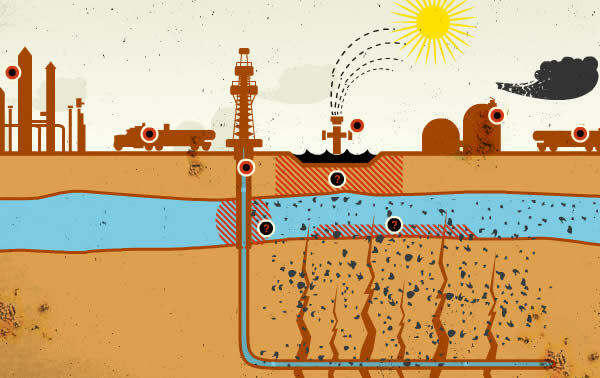 For extraction, drawing oil and natural gas from the ground with hydraulic fracturing techniques requires copious amounts of water. For refining and processing, water is needed for refining oil and gas, as well as for growing and refining biofuels. For transportation, water is needed for hydrostatic testing of energy pipelines. Given water’s tremendous role in energy production, it is no wonder that Saathoff was closely watching the Texas skies for rainfall last September. If drought conditions continued into spring, it would have major impacts on the state electric grid. Director of the Stockholm International Water Institute Jakob Granit says that given the scarcity of water resources, stronger regional cooperation will be important in making sure power plants are located in the best places. 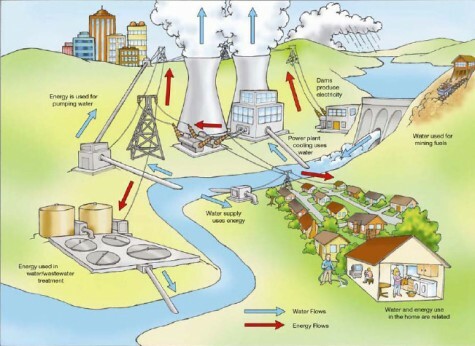 The implication is that power plants should be located near abundant water sources so that 1) they are not as susceptible to climate change, and 2) less energy will be used to transport water over long distances. Granit’s sentiments also point to an increasing trend of local and regional planners who realize the importance of examining water and energy issues together. The next blog post will look at what efforts are happening at the regional, state, and federal levels to address this critical and dynamic relationship. Stay tuned! Tags: energy, energy extraction, energy generation, energy processing, energy production, power plants, texas drought, water, water supply, water treatment, water-energy nexus | Permalink.